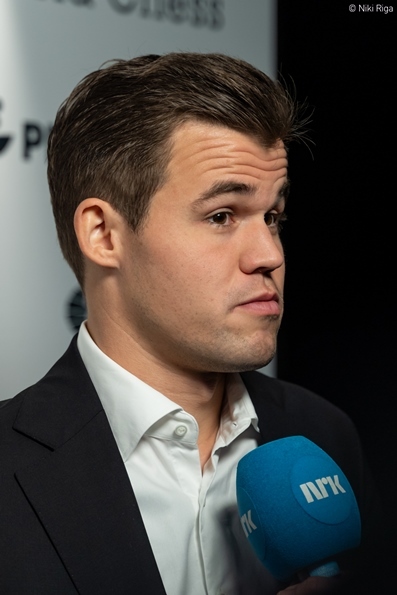 Magnus Carlsen switched to 1.c4 for Game 4 of the 2018 World Chess Championship in London, but when he rejected a pawn break on move 15 the game fizzled out into a 34-move draw. 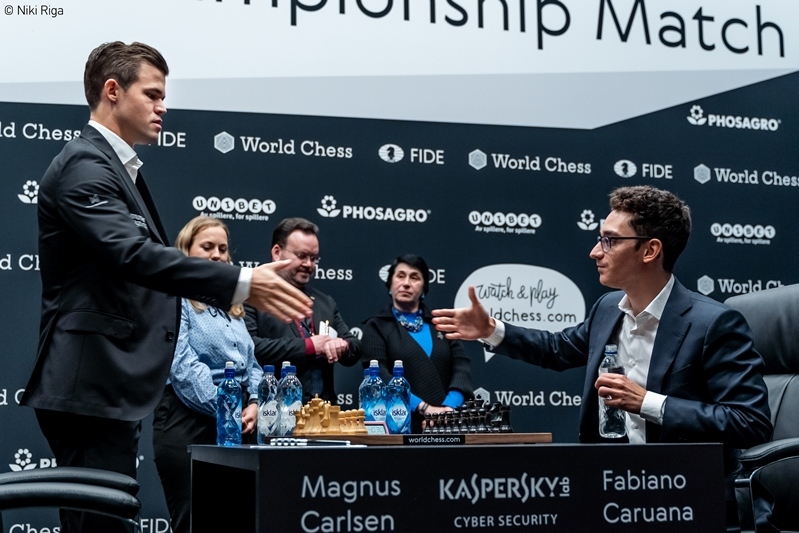 The main interest was off the board, since a hastily removed video by the Saint Louis Chess Club appeared to reveal far more secrets of Fabiano Caruana’s preparation than planned. “I will have a look at the video,” said Magnus at the post-game press conference, while Fabiano squirmed. 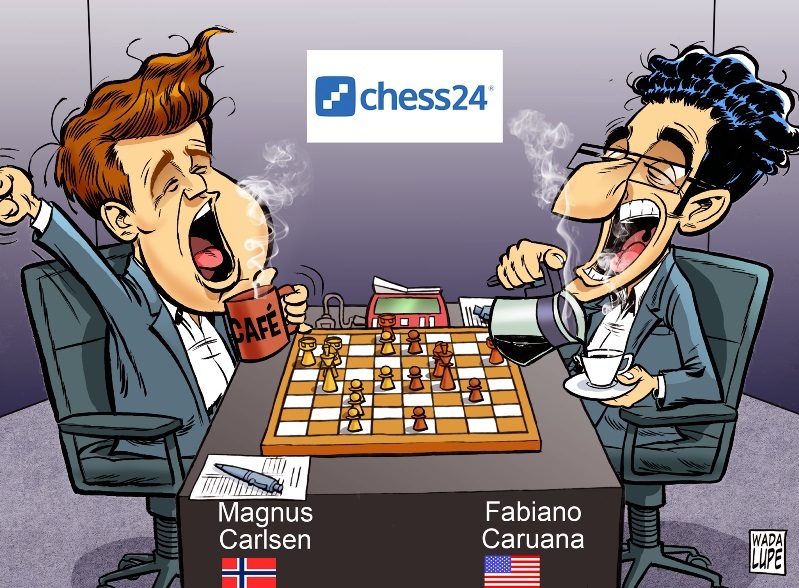 The video doesn’t reveal any Caruana team members we weren’t previously aware of from social media or elsewhere (Rustam Kasimdzhanov, Alejandro Ramirez, Cristian Chirila and Leinier Dominguez), and the study of the Carlsen-Karjakin games looks like a little joke – let’s give the cameraman something to film – but it’s the other filenames in the screenshot that catch the eye. For instance, “17.QGD Bf4 10.Rd1 Re8” is dangerously close to Fabiano’s big idea of 10…Rd8!? in the Queen’s Gambit Declined in Game 2. If Team Magnus had seen the video in advance would they have explored deeper and found the option played in the game, or avoided the line entirely? The post-game press conference indicated, however, that it was at least embarrassing for Fabiano, who responded only, “I’d really rather not comment on this, actually”. Well, I’ll have a look at the video, then make up my mind. We’ll see then. I can truthfully say that I haven’t seen the video, but I’m aware of its existence (I don’t think it “is” anymore). 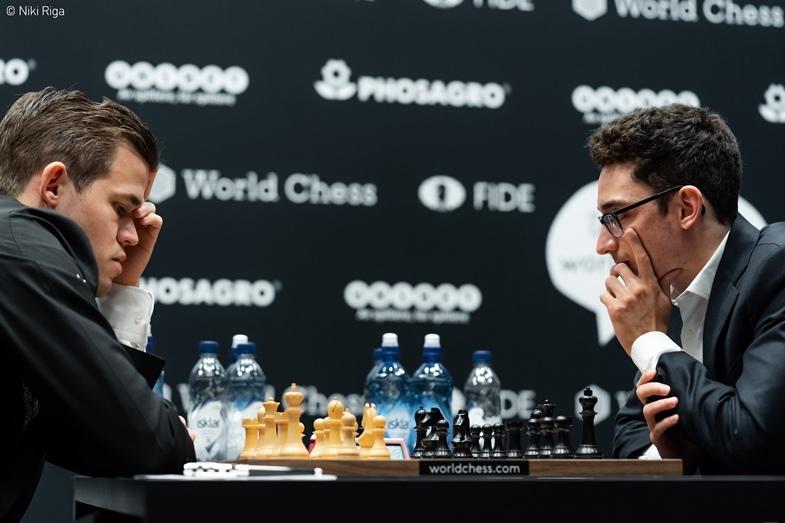 It’s probably good for Team Caruana that they now have a rest day to decide whether anything significant has been leaked that will require them to adapt their approach to the upcoming games. Magnus switched from 1.d4 not to 1.e4 (does a Petroff battle still lie ahead?) but to 1.c4, the English Opening. It’s not the most offensive opening, but it’s still not a defence, necessarily! But no, there was no special significance. I’m quite aware that we are currently in England, part of the United Kingdom, a country that this particular opening is named after, but I feel like that joke is a bit abused. Well there must have been, right?! Basically I should not get any credit for this move, because it was just the computer showed it. From my very childhood I always had an impression that after 1.c4 e5 Black just should not be any worse, because obviously White is a tempo up, but e5 is obviously a better move than c4, so at some point I just tried to find a way for Black not to equalise but just to play on even terms with White. I just was putting different positions on the computer, and here after 6.Bg2 it actually showed 6…Bc5 as the best move - giving zeroes, of course, and I was quite happy, looked a bit further at it and still could not find any refutation, and then I played it. 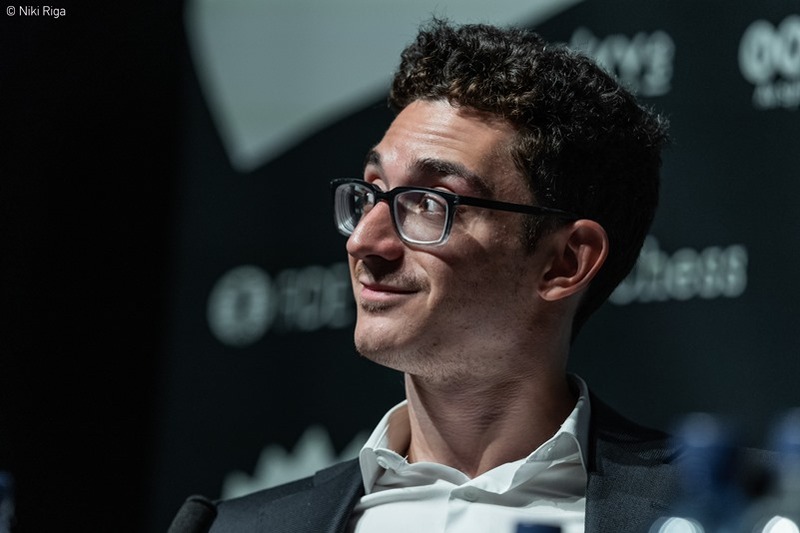 Caruana had played the line with both colours, and in fact up to 10…Nd4 was following a blitz game he played against Wesley So in the Paris Grand Chess Tour earlier this year. I spent a lot of time here, so that’s obviously what I was considering, but it didn’t seem to work very well for me. When I’m allowing 15…Bd7 basically it’s half of a draw offer. After that the position is very dry and very equal, but I just didn’t see what to do. I wouldn’t say that it’s an advantage. That’s a rash conclusion to make on a very limited sample size. It’s true that Black has been comfortable so far, but I think there will be sterner tests in the games yet to come. Probably prepare for the next game, try to regain some energy after these gruelling games that we’ve been having! 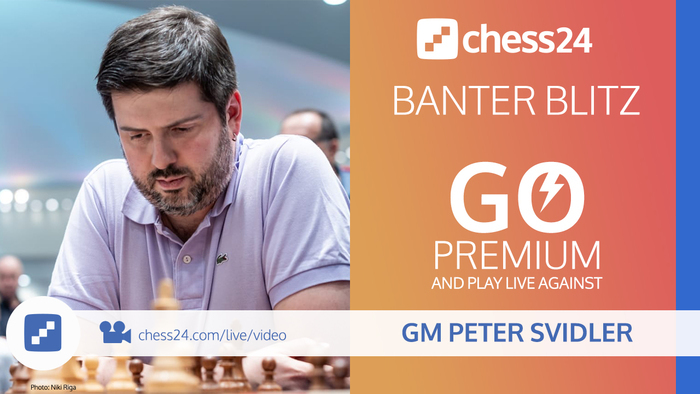 For chess fans there’s only one choice that makes any sense – tune in to Banter Blitz with Peter Svidler at 15:00 CET! As a Premium member (Go Premium for 1 year with the voucher code LONDON2018 and you’ll get 3 extra months free!) you can challenge Peter to a game.